The Star Wars Han Solo movie will apparently "break some rules" but what are they? The Han Solo movie will definitely "break some rules", according to Bradford Young. The cinematographer spoke to Collider about how he and directors Phil Lord and Chris Miller, who previously worked on expectation-defying films like The Lego Movie and 21 Jump Street, are bringing a unique vision to the familiar concept of a Star Wars prequel. "[N]obody at Lucasfilm is asking us to betray that, they’re saying ‘We’re in full support of what you do and we wanna make sure that we’re able to help you do it in the best way’. It’s gonna feel like a Star Wars film, but we’re definitely gonna break some rules, and we’re encouraged to do that. Visually, narratively that’s a good mandate". That's music to my ears; Star Wars is in danger of getting a little stuffy after almost 40 years of cinematic history. Here are the five Star Wars rules that I most want to see the Han Solo movie break. Han Solo is a self-serving schmuck. He can show some flashes of courage and integrity throughout his standalone film, but by the end he still needs to be the shady, abrasive criminal that Luke and Obi-Wan meet in a grimy booth at the Mos Eisley Cantina. The personal growth he experiences as the original trilogy's most dynamic character would otherwise be cheapened. He can still be the "good guy" when dealing with total scum, but he shouldn't like it one bit. Let me quote the man himself in A New Hope: "Kid, I've flown from one side of this galaxy to the other. I've seen a lot of strange stuff, but I've never seen anything to make me believe there's one all-powerful Force controlling everything." I know, I know, lightsabers are cool, but I am super ready for a Star Wars movie that doesn't boil down to the Jedi and the Sith making angry faces at each other. Luckily, all the Jedi are either dead or in hiding between Revenge of the Sith and A New Hope, so this one shouldn't be too hard. Star Wars has featured a few prominent alien characters like Yoda and Maz Kanata but most are set dressing or sidekicks for humans. I want to see prominent aliens all over the place - heroes, villains, comedy relief, and everything in between. R2-D2 and C-3PO almost certainly won't be around this time, so there's plenty of room in the latter category. There's a good chance we'll see how Han and Chewbacca met, but why stop there? 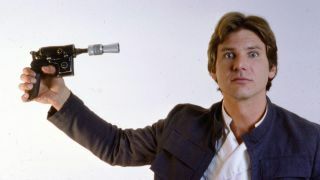 Basically, I want everyone to call Han Solo a nerf herder. So much so that when Leia hurls that insult at him in The Empire Strikes Back, he only takes issue with the "scruffy looking" part. Han's smuggling business will have him dealing with a pretty rough crowd, so there's plenty of room for new profanities to emerge in his business dealings. The other movies occasionally spice up their dialogue with fictional swears but I want the Han Solo movie to be slathered with bantha poodoo. You never know who to trust in a non-linear crime thriller like Reservoir Dogs or Memento. Allegiances shift from scene to scene and nobody ever, ever sticks to the plan. Han Solo's early days as a smuggler and general scoundrel-for-hire are the perfect setup for Star Wars to break free from its chronological storytelling. Is this exchange between Han and Lando set before or after Han steals, er, wins the Millennium Falcon? Does Jabba know about that missing spice shipment yet? And when is Boba Fett going to show up and wreck everybody? Directed by Phil Lord and Christopher Miller, and starring Alden Ehrenreich, the Han Solo movie is due to be released on May 25, 2018.